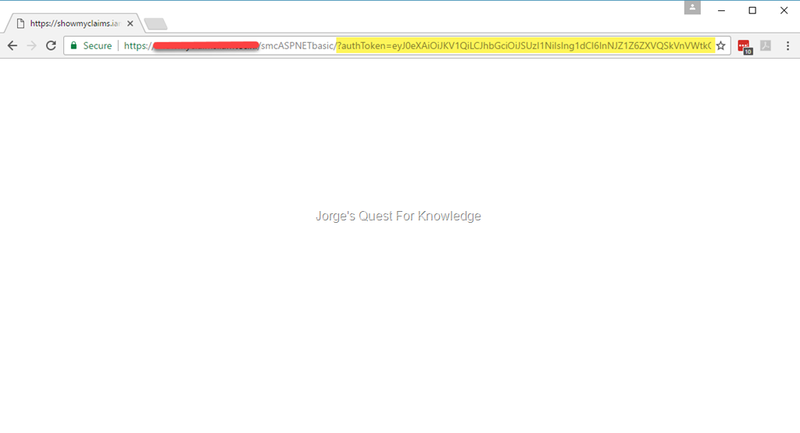 Security Tokens « Jorge's Quest For Knowledge! You are using ADFS v3.0, or higher, in combination with the Web Application Proxy (WAP) to publish internal applications to the outside. Some of those applications are published with “pre-authentication” and some of those applications are published with “pass-through”. On a device that is on the outside of your network, in a browser you enter the URL of an application that is published through the WAP with ADFS pre-authentication. 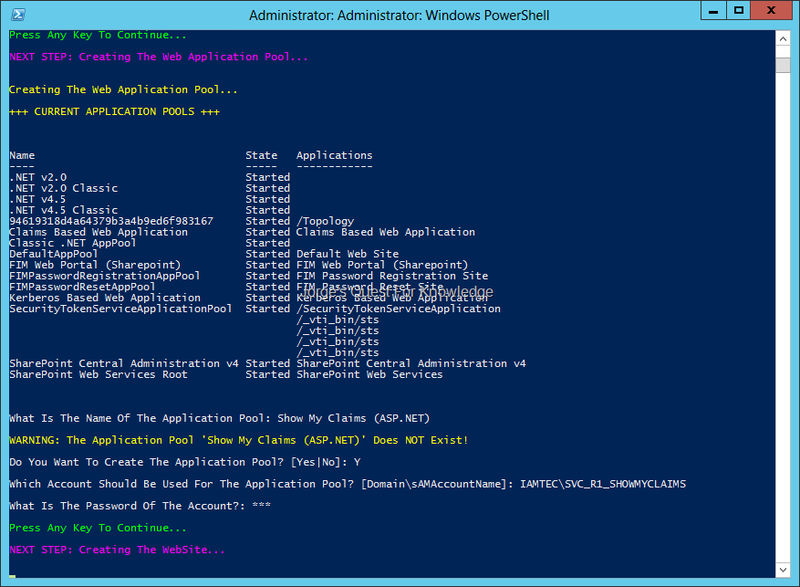 The issue I’m about to explain DOES NOT occur with applications published through the WAP with pass-through. Most likely you will hit a similar screen as the one below that is asking for Forms Based Authentication (FBA). 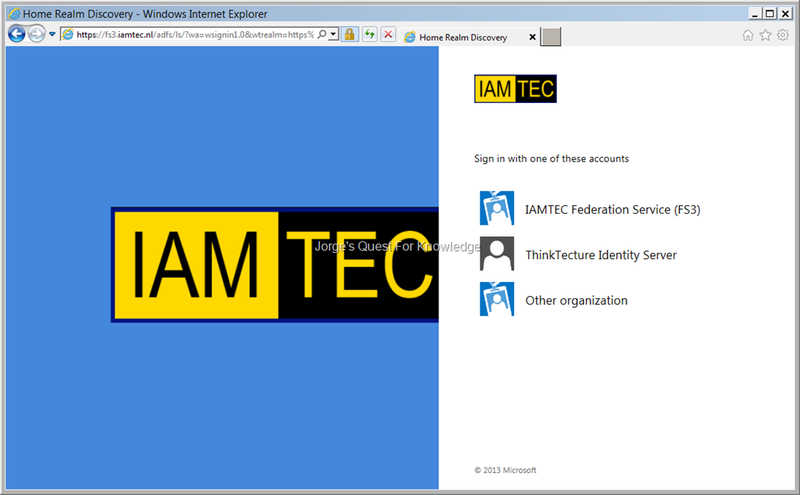 After entering the credentials you are redirected back to the application, and you end up stuck in an empty screen. When you look up at the URL, you may see something like “authToken=”. 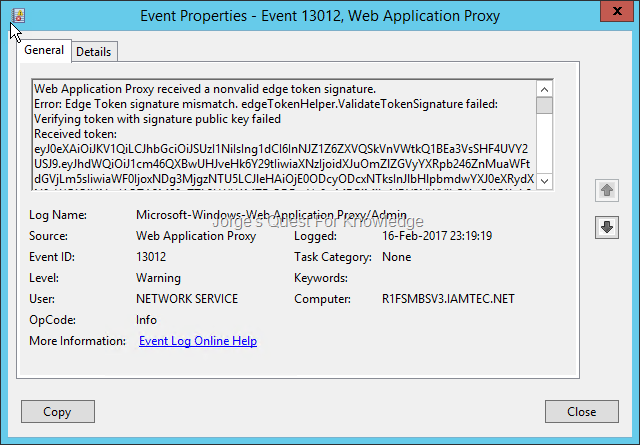 When looking in the Web Application Proxy Event Log you may find a similar event as the one below, telling you the Edge Token signing is not correct. 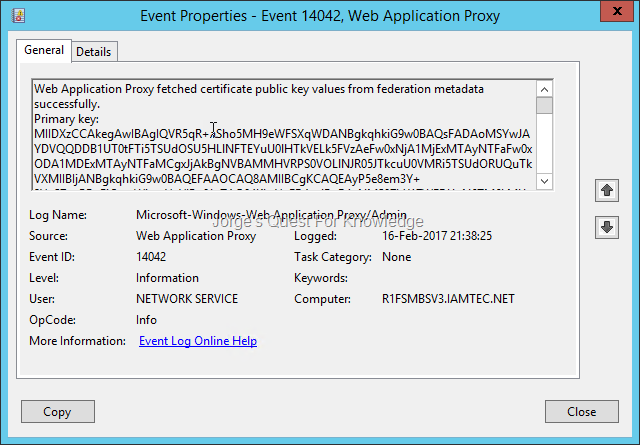 Web Application Proxy received a nonvalid edge token signature. 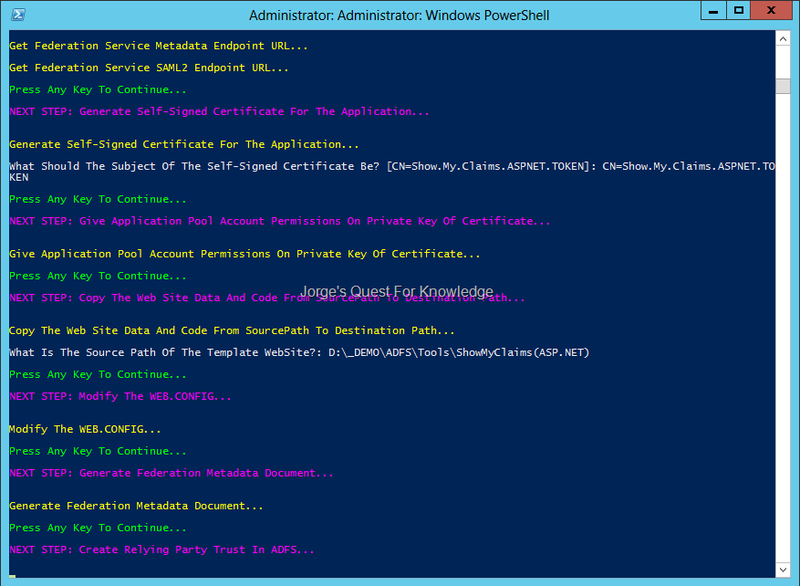 Why does Web Application Proxy show the ADFSTokenSigningCertificatePublicKey is “Obsolete”? 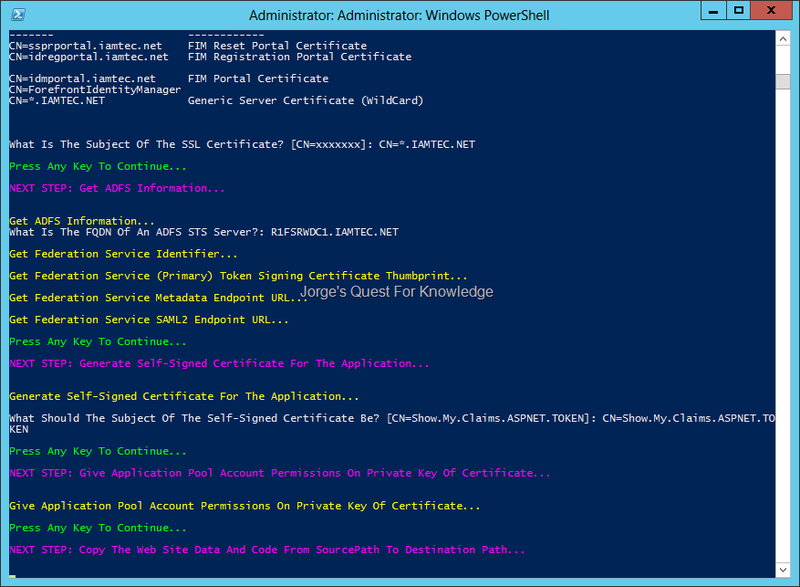 After the update http://support.microsoft.com/kb/2935608, you will the “ADFSTokenSigningCertificatePublicKey” property is marked as obsolete. That means you do not have to manually populate the public key of the ADFS Token Signing certificate, but rather WAP will leverage the ADFS metadata to discover the Token Signing certificates in use by ADFS. 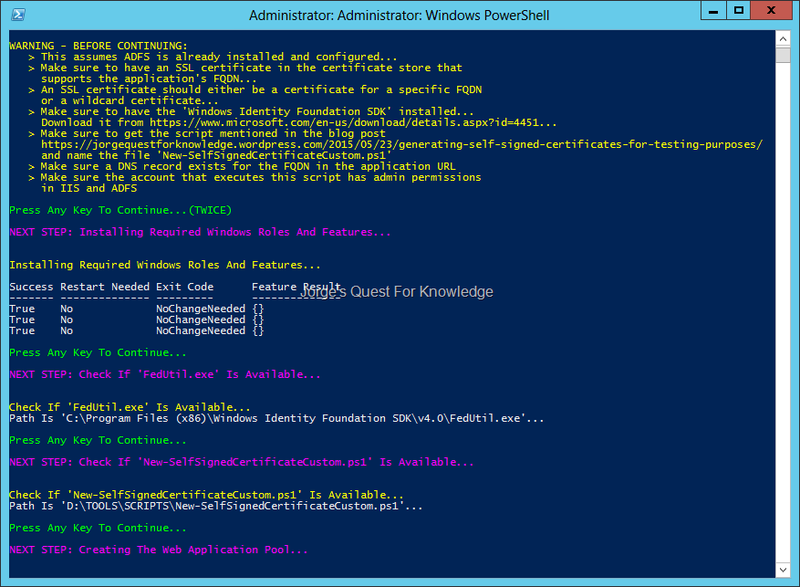 Within ADFS you can define multiple Token Signing certificates and one of those certificates is marked as PRIMARY and all others are marked as SECONDARY. 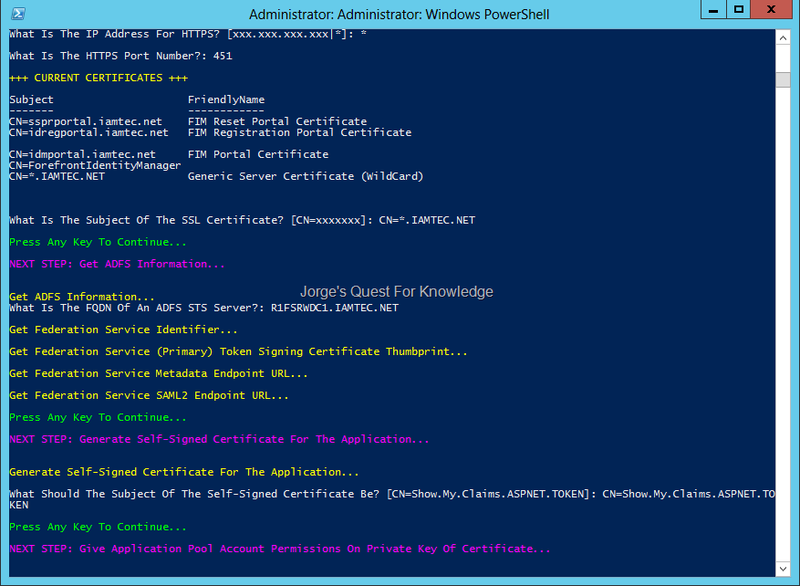 As you can see below you can see that my test/demo environment has 3 Token Signing certificates. 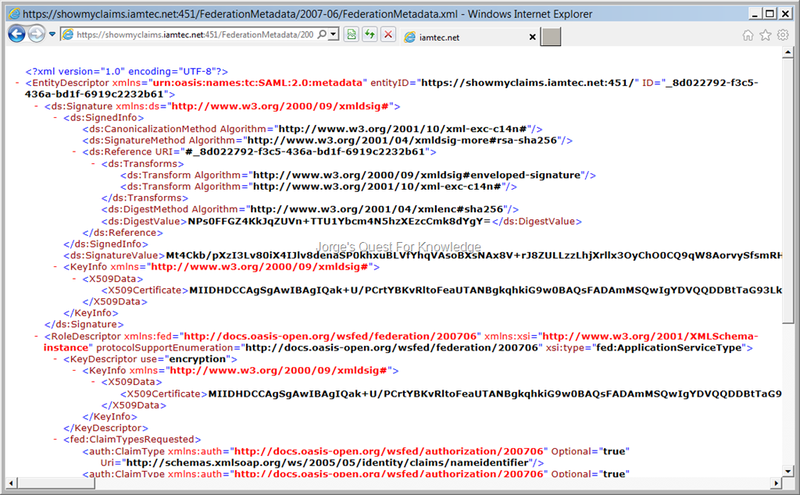 When you look into the ADFS metadata (URL: /federationmetadata/2007-06/federationmetadata.xml">https://<FQDN ADFS Service>/federationmetadata/2007-06/federationmetadata.xml), you will find all the Token Signing certificates listed in the “IdPSSODescriptor” section (for the role of IdP) and in the “SPSSODescriptor” section (for the role of SP), which have been marked as “use=”signing””. As you can expect and compare it to figure 4 above, you will see (in my case!) 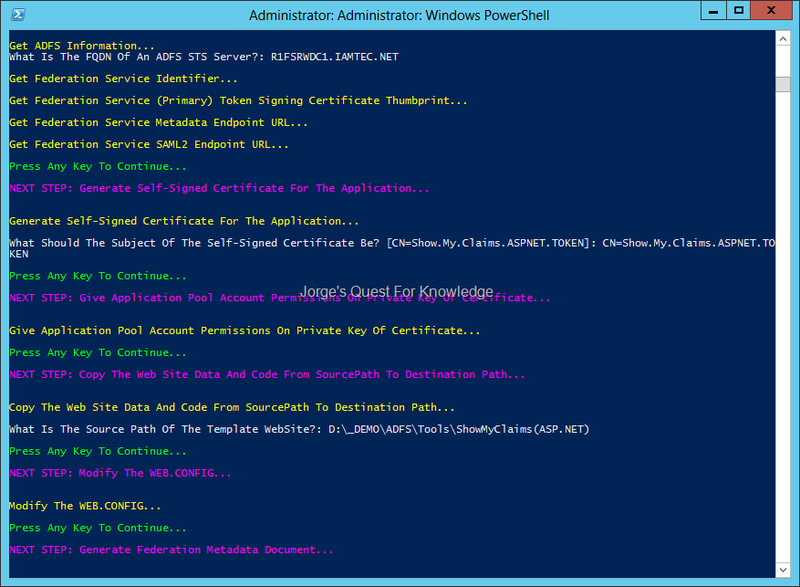 3 “KeyDescriptor”s, one for each Token Signing certificate in use by ADFS. 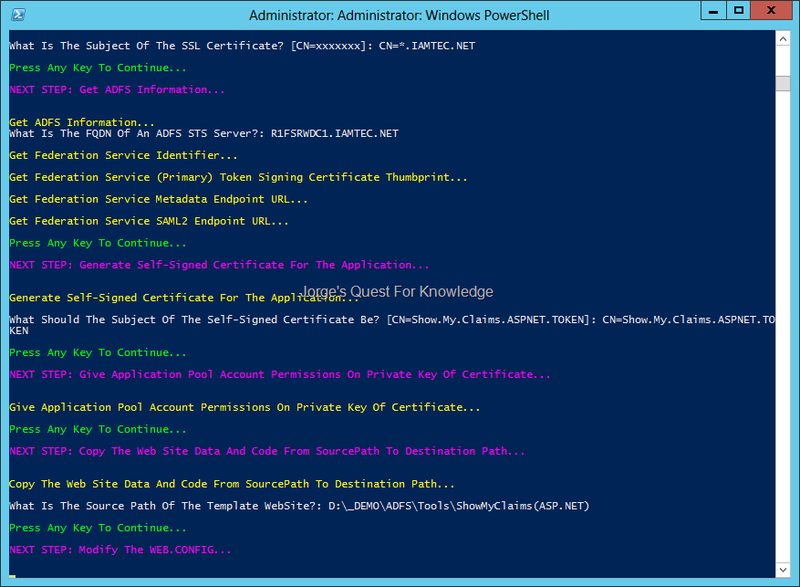 ADFS will always publish all Token Signing certificates in the metadata. no matter if they’re primary or secondary. In addition, ADFS will always publish only the primary Token Encryption certificate in the metadata. 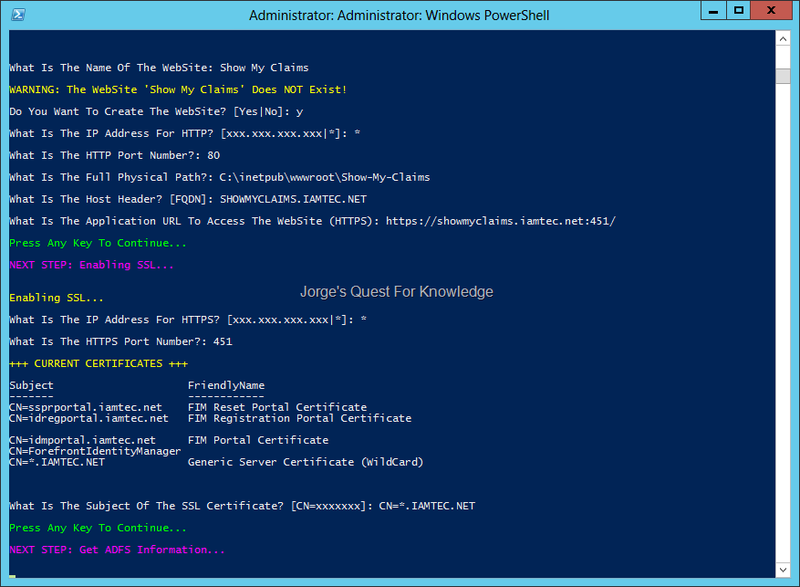 Using this website you can check the certificates in the metadata and get some output you can understand. 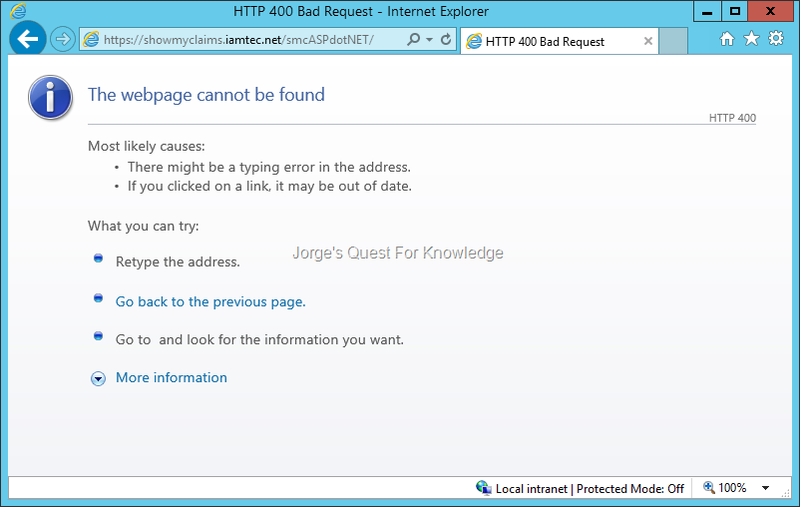 You copy the value between “<X509Certificate>…………..</X509Certificate> “ and enter that in the certificate text window. As mentioned before, WAP reads the ADFS metadata and picks up the Token Signing certificates in use by ADFS. HOWEVER, it only picks the first 2 occurrences designated as “use=”signing”” as disregards all other occurrences!. Therefore in my case it reads the first and second occurrence (Figure 6 and 7) and ignores the third occurrence (Figure 8). However, when you look in Figure 4 you will see that the certificate listed in Figure 8 is the primary Token Signing certificate that is being actively used by ADFS to sign issued tokens. Because of that WAP can verify the signature of the issued Edge Token and fails with the error as shown in Figure 3. 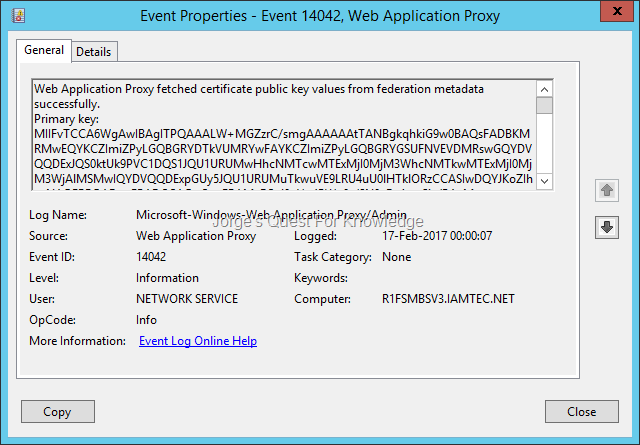 Web Application Proxy fetched certificate public key values from federation metadata successfully. Although this is my test/demo environment, what are the lessons learned here? Always have 1 Token Signing certificate and 1 Token Encryption certificate that are configured as primary and valid for some time (at least 2 or 3 years or more)! Some time before the Token Signing certificate and/or the Token Encryption certificate are going to expire (e.g. 2 months before expiration) add a new Token Signing certificate and/or Token Encryption certificate (whatever is applicable) and make sure it is marked as secondary. In my case the solution is: remove at least one of the secondary certs. I removed all secondaries! ending with only one as you can see below. 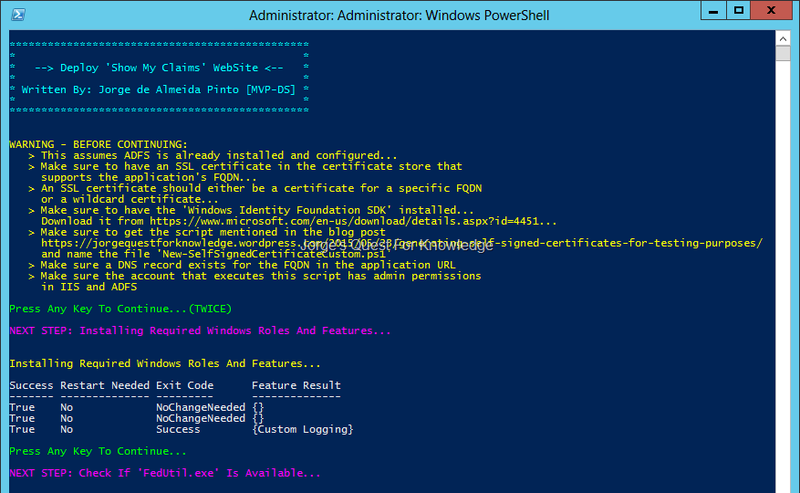 After these actions the application published through the WAP and configured with ADFS pre-authentication was accessible again from the outside! 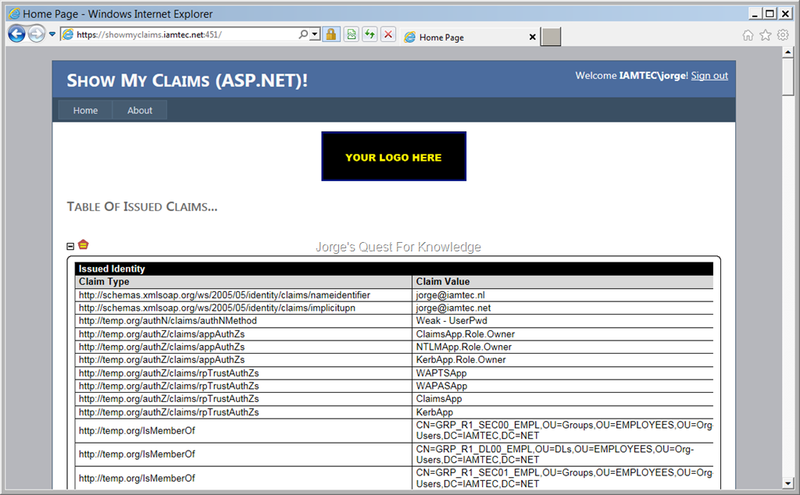 Do you have a claims based website and do you get the following error when accessing the website? Does the problem go away if you remove a large number of claims rules that issue a large number of claims? If yes, the issues is most likely that the "Request header too long", although it is not mentioned. When that happens, in this case, the user is not necessarily a member of too many groups. In this too many claims having generated and presented to the application. The solution is to increase the default HTTP header or packet size. See the first article on the list of articles below to understand how to solve it. 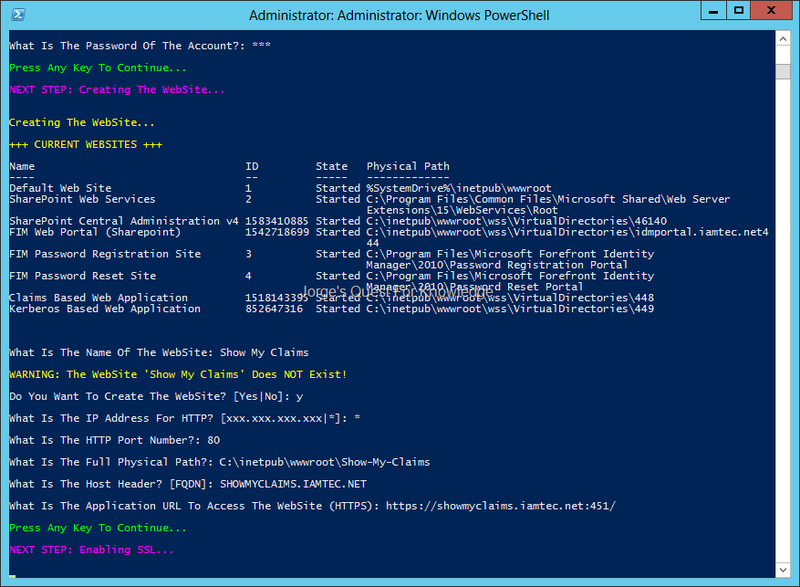 However, Instead of increasing the HTTP header or packet size, see if you can optimize the claims rules to process/issue less claims! After configuring this, reboot the server!! (2014-10-28) You Have Multiple AD Forests And You Also Need ADFS – What Are The Possibilities? In the following blog posts I explained for which user accounts an ADFS STS was able to issue security tokens: (2013-09-24) AD User Accounts For Which The ADFS STS Can Generate Security Tokens. Unless your AD forests have a forest-wide two-way trust with the AD forest hosting ADFS, you would need to deploy an additional ADFS instance for every other AD forest and setup federation. In this post let’s have a look at some subtle differences in setup, and also something new that recently became possible. The biggest downside here is that in this scenario you have a very powerful system, the ADFS STS server, in the DMZ that is allowed to issue security tokens for connected applications on the internal forest or in the cloud. If that ADFS STS server is compromised, everything connected to ADFS (e.g. applications, other federation systems) goes down the drain. In addition, if the service account from the internal forest, which is used on the ADFS STS server in the DMZ forest, is compromised, it can be used to access anything on the internal forest where it has explicit permissions, or through authenticated users. Rule of thumb: NEVER place an ADFS STS in a DMZ forest! This scenario would also not work when you have multiple forests compared to the DMZ forest. You would still need to implement an ADFS instance in the forests similar to the DMZ forest. REMARK: I would never suggest this setup as its security is really bad. The biggest downside here is that in this scenario the ADFS service is able to perform any LDAP query for anything it likes. Besides that you have to configure it in such a way that it does not become a management nightmare when you add new DCs and/or remove existing DCs. The only way to achieve that easily would be to configure the permissions on the "Domain Controllers" OU in every AD domain in the internal forest. This scenario would also not work when you have multiple forests compared to the DMZ forest. You would still need to implement multiple AD service accounts which ADFS does not support. REMARK: I would never suggest this setup as its security is really bad and I do not like the setup either. DMZ users to authenticate against the ADFS STS server, but only AFTER those users have been given the explicit permission "Allowed To Authenticate" on the ADFS service account. 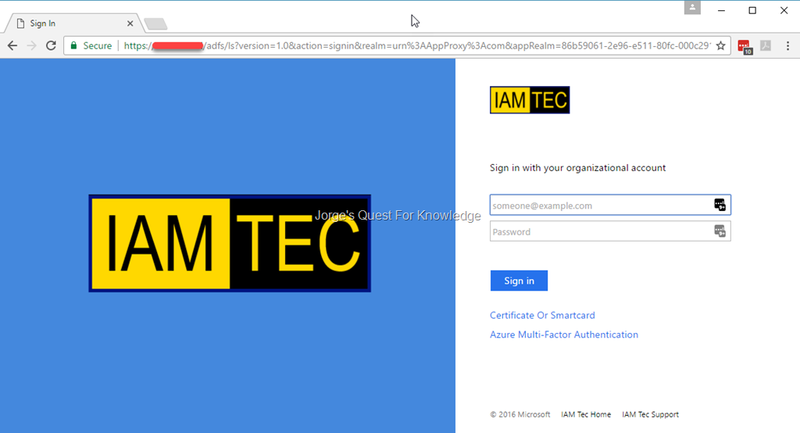 This can be done through a custom security group, which needs to be managed, or by just using the "Authenticated Users" well-known security principal. This way all important and secure resources are in the internal forest, and DMZ users can only authenticate against the ADFS STS server and nothing else. REMARK: I would suggest this setup as its security and setup is better than the previous 2 scenarios. 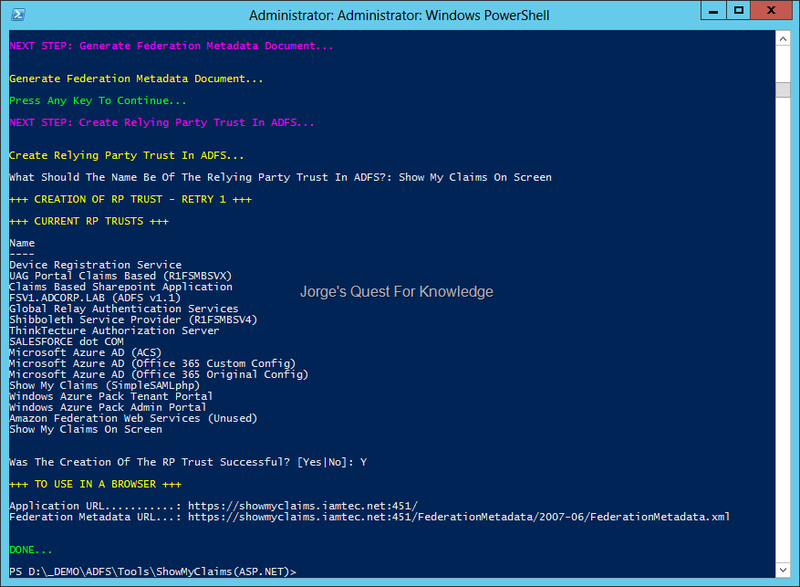 The ADFS service account to retrieve attribute info for users part of the DMZ forest, through the credentials configured for the local claims provider. The biggest downside here is that this scenario is only possible with ADFS v4.0! 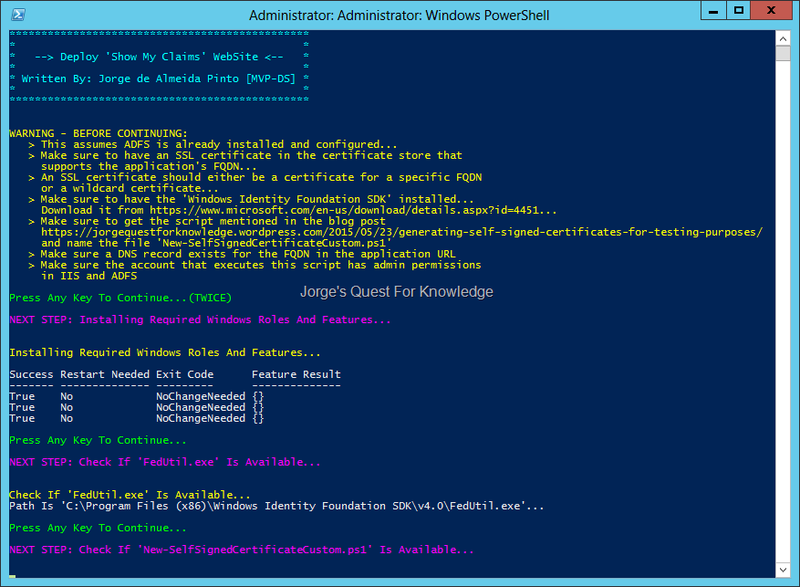 For more information see: (2014-10-20) Configuring A New Identity Store As A Claims Provider In ADFS. This scenario would also work when you have multiple forests compared to the DMZ forest. 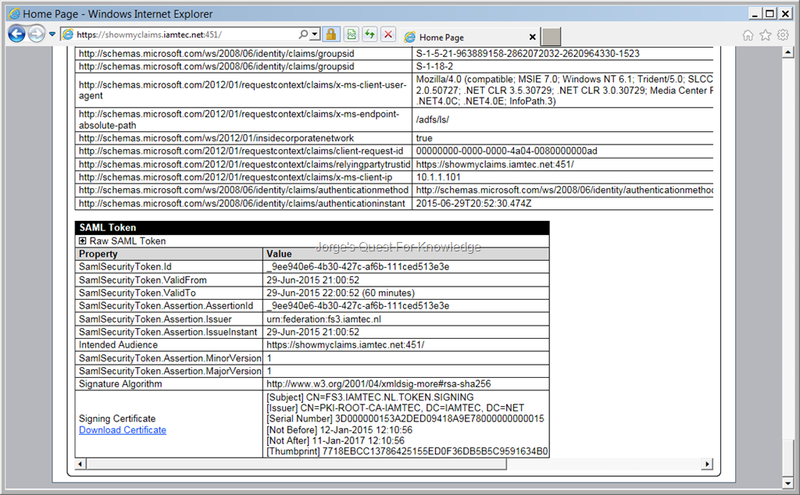 You would to configure a local claims provider for every untrusted AD forest. REMARK: I would suggest this setup as its security and setup is better than the previous scenarios as it does not require Windows trusts at all! I have seen or heart multiple times if ADFS can provide security tokens for users in other forests. If YES what are the requirements to achieve that? 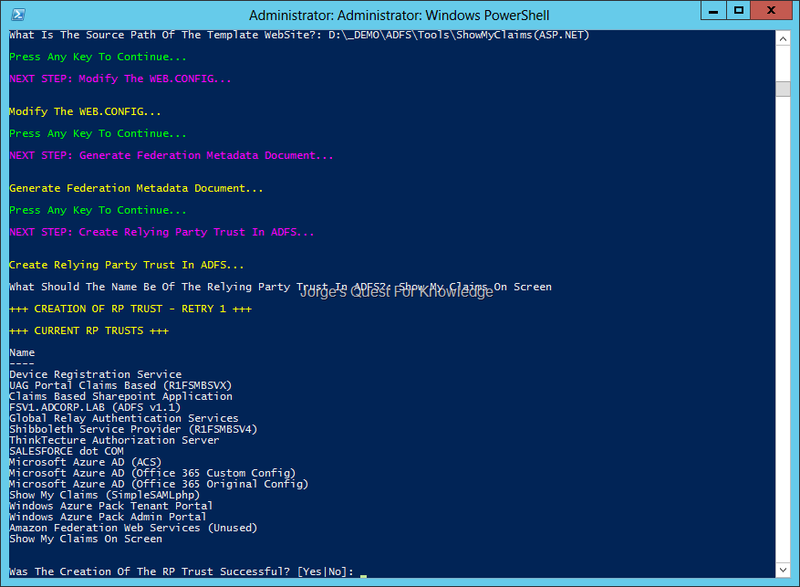 User accounts in any AD domain/forest for which a two-way trust exists with the AD domain/forest of the ADFS STS server. If you have an AD forest with multiple AD domains, you only need one ADFS STS farm to be able to issue security tokens for all the users in the same AD forest. If you have multiple AD forests, you only need one ADFS STS farm in any of the AD forest AND every other AD forest must have a two-way trust with the AD forest where the ADFS STS farm is installed in. If any of the AD forests does not have or cannot have a two-way trust with the AD forest that hosts the ADFS STS farm, then that AD forest must host its own ADFS STS farm. 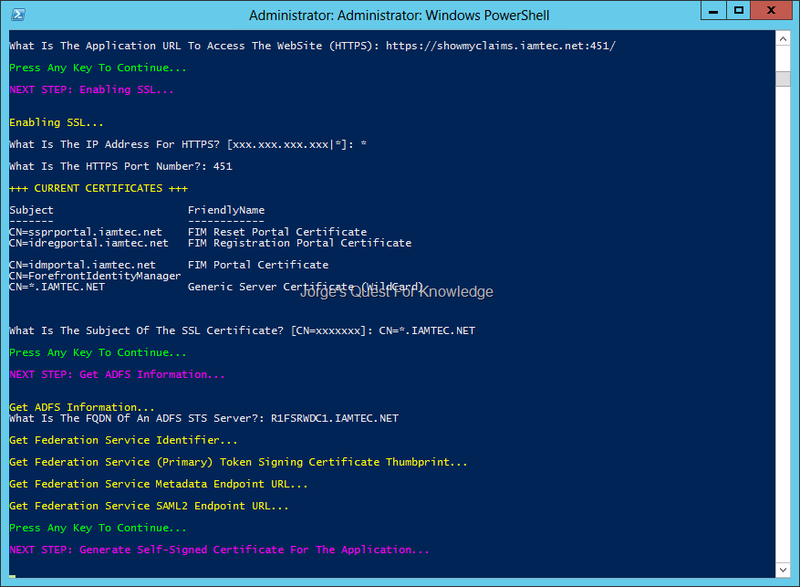 Be aware to consider the ADFS STS as a writable DC and also secure it as such! Anyone in control of an ADFS STS is able to issue security tokens. If for whatever reason you need to connect to your STS server from an untrusted network (e.g. the internet) you would need to have a federation (reverse) proxy server or a unified access gateway (UAG) server with SP1 as an intermediate.